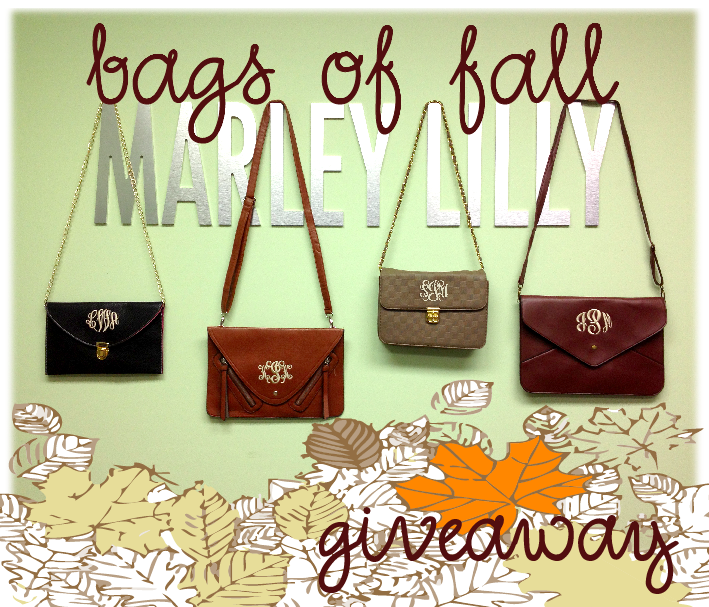 What's a better way to start off the fall season than giving away FOUR of our lovely cross body purses? With all of the colors and styles available, we have a purse that will fit everyone's personality! We think any of our bags of fall would look great with your new fall wardrobe! We are giving away a Luxe, a Peyton, a Sarah & a Penny this week! Read below for more information about each purse as well as giveaway entry rules! Happy Fall Y'all! The Luxe clutch is made of synthetic leather and has a pebble finish to the material. The hardware is gold in color and there is a removable strap so the bag can be carried as a personalized clutch or a monogrammed crossbody bag. The Luxe Clutch measures 11 by 7 inches and comes in a variety of bright colors. Each bag has a different color trim as you can see by the photo. The trim color is not very obvious, but it is a nice detail that adds to the Luxe feel of the bag! The clutches from one dye lot to the next do vary slightly, so if you are trying to match a large bridesmaid order to a previous order, we suggest contacting us before ordering so we can ensure orders placed during different weeks will match color tone perfectly. In case we do have multiple dye lots in stock and you want the "darkest" or "lightest" shade in terms of color, just make a note on your order! Inside there is a snap closure to help keep important items inside the bag where they belong. The Sarah style monogrammed crossbody bag is here! This bag comes in 4 great colors. On the interior, it has two pockets on the front and a zipper pocket inside. The bag also features a zipper so things don't fall out! The clever gold clasp on fronts adds a classy closure feature and matches the gold in the chain strap. This crossbody bag is made of synthetic materials and features a lengthy strap so it can go across all bodies! It measures 10.5in by 7 inches and is 2.5 inches deep. 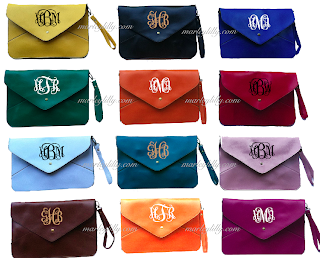 Monogrammed Peyton Clutch! The bag has two zippers on the front and a snap closure. It measures about 13 x 9 inches! The material is synthetic leather. PLEASE NOTE: This bag does come with a strap. We do NOT suggest you carry this bag with the strap. We are selling the bag as a clutch, not a purse. If you want to carry this bag as a purse, we suggest you take this to a sewing store and have the strap permanently fixed to the bag from the inside rather than the back. The strap does not support the bag as a cross body bag. Once you put weight in the bag, the strap could tear. We cannot be liable for this. We considered no longer selling the bag due to this issue but due to customer requests, we have kept it online. Thank you for understanding! The newest monogrammed gift is here, the Penny Bag! This great bag features three different ways to carry one purse! You can carry the bag as a wristlet, a cross body bag, a purse, or even just a clutch! It measures roughly 14 by 9.5 inches but each bag can vary slightly. The strap clips on and off and the bag has a zipper in the back. The bag is made of synthetic leather. Shop these bags at Marleylilly.com! 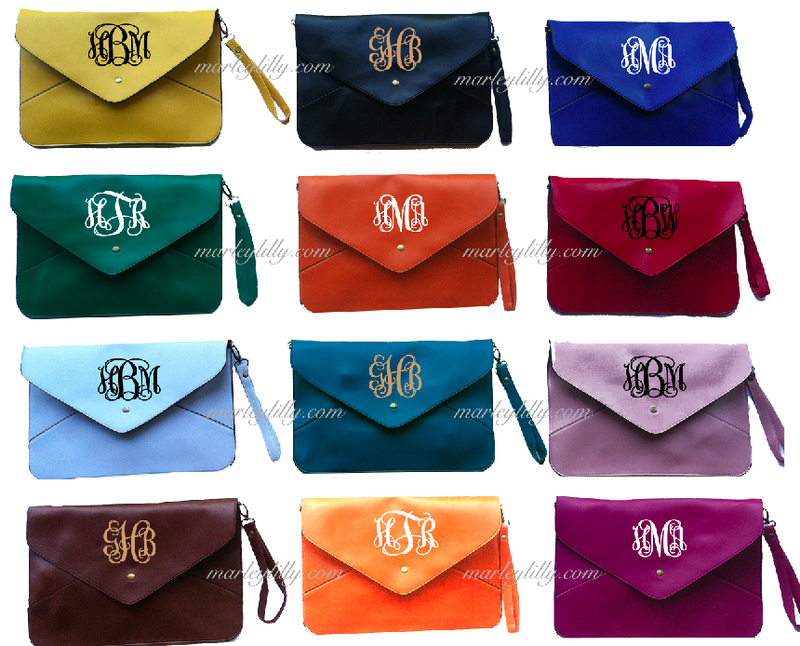 Enter to win a free monogrammed cross body purse from Marley Lilly! It's as easy as 1, 2, 3! Follow our blog, The Monogrammed Life! We will randomly select 4 WINNERS on Friday, October 12th at 10:00 am EST! We will privately message our winners on Facebook, so be sure to check your messages! So excited about this. I have been wanting something monogrammed for so long! 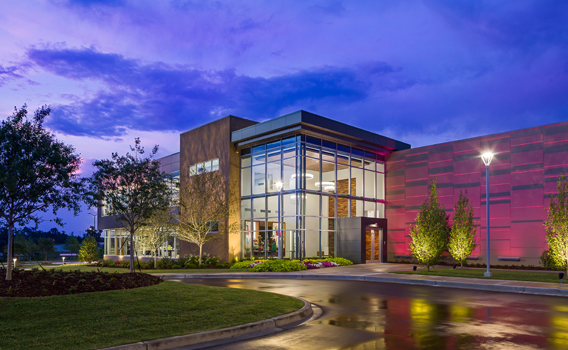 liked, shared and following on gfc- cindy batchelor ! love the bags!! Have fallen in love with these!!! Love the classic timeless way a monogram looks! Posted, Liked, and Following! I LOVE these all sooooo much! Liked, following, and share. Thanks for hosting such a great giveaway! These are ALL ANNOYINGLY CUTE! Love love love your stuff. Love all you Pinterest stuff! TY for hosting such an awesome giveaway! Liked Shared & Following!!! Fingers Crossed!!! I <3 ML! All entered!!! Hoping I win! I am so excited! I hope I win! LOVE IT ALL! Hope I win! Ooo I would love to have a beautiful new purse! !